As soon as I read the words PIE PARTY! I was hooked. An idea sparked by Shauna from Gluten Free Girl and the Chef blog grew to over 1200 peeps across the internet making pie and posting about it on the same day. LOVE IT! Thanks Emily from Nomnivorous for the invite! In my show, The Fried Chicken Theory According to Jackie Gordon, I introduce the dessert platter featuring this pie, by calling myself, “The Pimp of Pie”. If I were the pimp of pie this would be one of the finest “ladies” in my stable. It’s layers of espresso chocolate ganache in a graham cracker crust, topped with freshly sliced bananas, a pile of vanilla bean pastry cream, then whipped cream and chocolate shavings equals a mouthful of YUM! It’s a great pie to make in the summer since there is very little baking involved. I baked the crust in my toaster oven set to “Fan Bake” and it came out super crunchy—more so than when I make it in a regular oven. There’s a few components to it, but I whipped it up in a few hours by cooling the pastry cream in an ice bath to speed things up. This recipe is based on Maida Heatter’s Black Bottom Pecan Cream Pie from her Book of Great Desserts. When I was a waitress at Memphis in New York, I also did some pastry cheffing there and this dessert was a HIT! Loved getting involved with a virtual pie party. My only regret is not being able to taste everyone’s pies—that would’ve been heaven! Must make an actual pie party happen in the fall. In the meantime, you can whip this up. This was the pie that I served as part of a platter of six desserts, in my show “The Fried Chicken Theory According to Jackie Gordon: an evening of sultry soul food and sweet soul music.”. It is how I earned the nickname “The Pimp Of Pie”. In a bowl, combine graham cracker crumbs with butter and sugar till well mixed. Press mixture evenly along the bottom and sides of a 9-inch pie pan. Bake for 8 minutes; cool before filling. In a food processor, fitted with steel knife, chop chocolate till fine. In a small saucepan, heat cream until tiny bubbles appear around the edge of the pan. Remove from heat. With processor running, pour warm cream into chocolate and process until melted and smooth. Turn off machine. Make sure you stir in any chocolate that’s caught in the edges of the bowl of the food processor. Stir in espresso powder. Pour chocolate mixture into crumb crust and cool in refrigerator until firm. Whisk egg yolks with sugar in a large bowl. Add corn starch, flour and stir until smooth; set aside. Pour milk in large saucepan. Split the vanilla bean in half length-wise and add to the milk. Over high heat, bring mixture just to a boil and remove from heat. Take out the vanilla bean and scrape the seeds back into the milk. Discard the bean. Whisk half of the hot milk into the egg mixture. Then mix the now warm egg mixture into the saucepan with the remaining milk. Return the saucepan to medium heat and bring to a boil, whisking constantly until thickened, about 2-3 minutes. Pour pastry cream through a fine strainer, into a bowl and whisk in the butter. Cool slightly. Cover the surface with plastic wrap to prevent a skin from forming and cool in the refrigerator until cold. Once pastry cream is cold, slice bananas in rounds and place cut side down in one layer on top of chocolate ganache. Make sure bananas lay flat. Spoon the pastry cream over the bananas and smooth with a rubber spatula to make sure the bananas are completely covered (if they’re exposed to air they will turn brown). Pastry cream should thoroughly cover chocolate ganache layer and touch the crust. Cover the pie with plastic wrap and chill in the refrigerator until firm. Combine gelatin and cold water in small heatproof measuring cup or saucepan, and mix thoroughly. Place over low heat, stirring constantly just until gelatin dissolves. Remove from heat and allow to cool slightly. Whip cream, sugar and vanilla until it thickens slightly. In a steady stream, slowly beat gelatin into whipped cream mixture thoroughly. Add vanilla and whip on high speed until stiff, but not dry. Remove pie from refrigerator. Put whipped cream in a pastry bag and pipe it over pastry cream in a decorative manner. You may have to use half the mixture at a time. Chill. 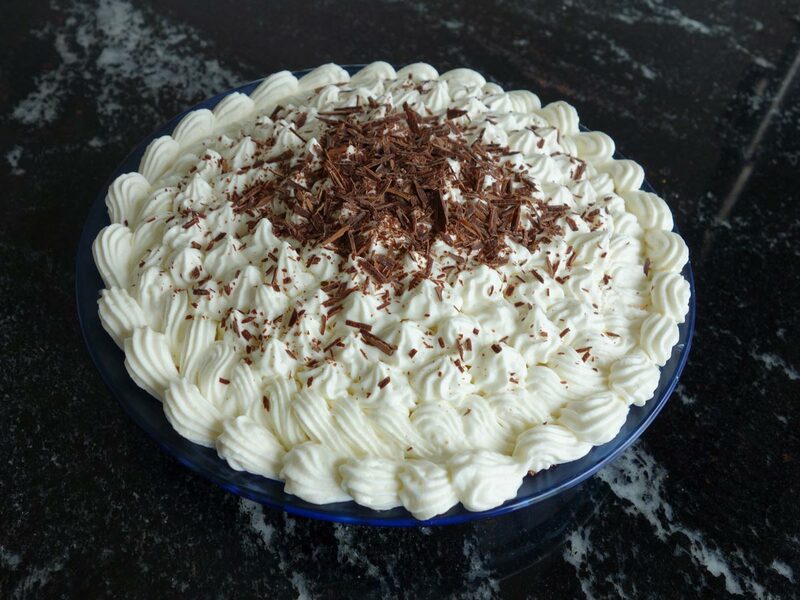 Before serving, decorate top of pie with chocolate shavings and banana chips. You can use chocolate chips, curls, sprinkles or cocoa too. The cook time doesn’t include the time it will take to cool the pastry cream and the ganache. You need to allow extra time for that. You can make this pie in a the middle of summer by baking the crust in a toaster oven. I find that cookie crusts come out better in the toaster oven. It may be that the heat is more intense and concentrated than in the a large oven.